Among all units on the 2019 Twins roster, none are subject to more controversy and skepticism than the bullpen. It was the team's biggest question mark heading into the offseason, and the front office did very little externally to address it. Can this relief corps hold up? The Twins have no closer. You might be confused reading that sentence under "THE GOOD" banner but to me, it really is a positive. We have no idea what to expect from Rocco Baldelli as a bullpen handler, but at least the rookie manager doesn't seem eager to constrict himself to rigidly defined roles. Despite its analytical awakening, Major League Baseball has lagged behind in terms of relief usage sophistication, plagued by the "save" and its overinflated prestige. If he simply makes a habit of using his best available arms in the highest-leverage spots – a formula that hasn't always taken hold in a game ruled by conventional hierarchies – Baldelli could find himself with an edge over opposing teams that reserve their best reliever until it's too late. And on any given day, the skipper might just find himself with multiple high-caliber arms available. Rogers, May and Romero are poised to form a fearsome trio in the late innings. 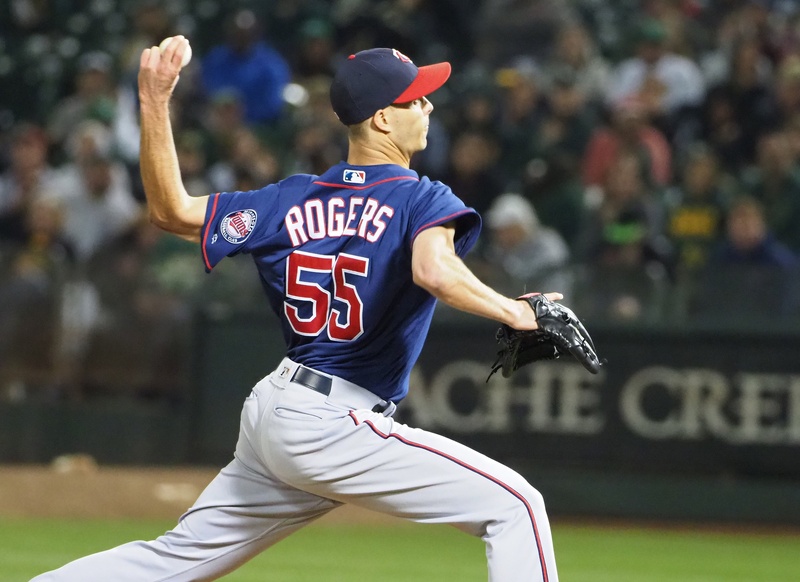 Granted, only one of the three (Rogers) has already established himself as a top-tier reliever, but both May and Romero show all the ingredients. May flashed overpowering stuff as a full-time reliever in 2016, though he was hampered by back issues and inconsistent results. After losing his following season to Tommy John surgery, he came back last summer like a man on fire, piling up whiffs with mid-90s heat and powered-up secondaries. In 25 1/3 innings, he held opponents to a .221 average with a 36-to-5 K/BB ratio. Romero hasn't officially tried his hand as a reliever, but he has unsurprisingly taken well to the assignment this spring. His ferocious stuff seemed to play down as a starter, so the Twins are wagering it'll yield stronger results in short stints – a reasonable bet. In nine innings this spring, he has held opponents to a .188 average and .219 slugging percentage with heavy sinkers in the high-90s. He could be a hell of a weapon as a multi-inning fireman type, which appears to be the role Baldelli envisions for him. Behind the Big Three, the Twins have a couple of veterans with strong track records in Parker and Addison Reed, though each is coming off a down year. Mejia has been a competent major-league starter and could be a nice asset as a long man out of the pen if his repertoire levels up at all. Magill averaged a strikeout per inning as an out-of-nowhere rookie last year, and has been touching 96 on the radar gun this spring. Hildenberger is the big-time sleeper here. When he's on his game (as he was for his first 70 or so appearances as a Twin), he brings an ultra-reliable mix of grounders, strikeouts and control, but he was not on his game in the second half last year. That might leave him on the outside looking in when the spring training dust settles next week, but don't count him out as an important contributor to this bullpen. It's also possible a non-roster sleeper in camp could find his way into the picture, either at the outset or a short way into the campaign. Harper is the current favorite on that front. Collins, Morin and Jake Reed have also caught some eyes. The Twins lost a critical piece of their 2019 bullpen when they traded Ryan Pressly to Houston last July, and they haven't done nearly enough to fill that enormous void. There is one reliever in this group that you can truly feel confident in based on his recent history: Rogers. That's it. Romero and May are full of potential but neither has really proven himself. Addison Reed was a mess last year and has been this spring too. Parker's performance in 2018 was uninspiring enough – despite the 3.26 ERA – that the Angels non-tendered him, and he went unsigned for six weeks until Minnesota inked him to a meager $1.8 million deal. Mejia and Magill? Both are on the fringe of major-league viability. What's worse: the depth isn't really there to plug holes as they emerge. The best hope for an impact prospect infusion is probably Alcala, who came over from Houston in the Pressly trade. The 23-year-old possesses a high-90s fastball and a slider with the makings of an out pitch, but he was underwhelming and injured after joining Minnesota's Double-A affiliate so it's tough to view him as a short-term difference-maker. The relegation of Jay, the club's top draft pick in 2015, to afterthought status looms very large here. This bullpen seems far more likely to turn into an unmitigated disaster than a competitive advantage. All it takes is an injury to one of those key late-inning linchpins, or a couple of critical guys failing to assert themselves, and Baldelli will quickly find himself short on options he can trust. Last summer the Twins traded away one of the 10 most valuable relievers in baseball (according to fWAR), whom they still controlled in 2019. They dealt him to Houston, one of the teams they will ostensibly be competing against for the AL pennant this year. The Astros just signed him to a two-year, $17.5 million extension, indicating he'll be a building block for their elite bullpen going forward. And most damningly, the Twins failed to replace Pressly during the offseason with any kind of proven, high-impact asset to bolster the back-end of their pen. Their lone addition was a 33-year-old non-tender whose guaranteed salary was docked by health concerns. Oh, and the guy who will be pulling the strings has zero experience managing a bullpen. Same for both of his rookie pitching coaches. By nature, bullpens are highly volatile and unpredictable. There was nothing Minnesota's front office could've realistically done to establish this unit as any kind of "sure thing," but their efforts to shore it up seem woefully deficient. They are pinning their hopes on a whole lot of gambles playing out right, and Twins fans are too jaded from past trauma to feel much confidence in that outcome. What's most vexing about this situation is that the Twins have otherwise developed a pretty solid roster with legitimate potential. There ain't much more frustrating than building leads and watching them slip away in the latter parts of games. Unfortunately, this club seems destined to make that a routine occurrence if their planned power trio doesn't gel in the late innings, or the various questionable parts surrounding them fall the wrong way. The good news, I suppose, is that it's easier to upgrade relief pitching in-season than just about any other position. I like having a big bad bull in the back of the pen, think Marshall, Reardon or Aguilera. I also like defined rolls. The game is fluid and pen arms can warm up quickly but mentally it's easier if you have a roll. Yeah, I feel like May is the closer. He's that "big, bad bull." He's got tenure (on the team at least.). Certainly has the stuff. They're gamboling,(thanks autocorrect) and they are gambling as well. But short of the Yankees approach, it seems almost every bullpen is a gamble. The World Champion's bullpen seems awful to me right now. Presumably, the Twins can turn around and trade Alcala for this year's Pressly when the time comes. If it comes. In the meantime, they aren't doling out contracts to Addison Reed, or Greg Holland, or [insert cherry-picked flamed-out high-dollar reliever here]. Skip down to get to the bullpen part...they mention Joe Nathan! OK, so we are trying something new.We'll see how it goes.Data is important, but if the entire league does not embrace the best available arms in high leverage situations then is there really enough data to determine that this is a better route.And, does the data also suggest that there is no drop off in pitcher performance in less defined roles?I am excited for this season, but am really worried that pitching let-downs in hight leverage situations will cost us a bunch of wins. I would add Eades as depth also. Louisiana high school player of the year and MVP of the Cape Cod League. Never understood why he didn't make it. Very good last half season last year. The easy answer for a stable bullpen is Addison Reed. Need to let that play out. Eades looks like he has the repertoire, at least to this amateur's eyes. Could be a sleeper for later in the year. I have no confidence in Addison Reed. Ryan Pressly was good but not elite until he joined Houston.He has publicly credited Houston coaching as the reason he was so good last year.If we are talking about replacing the 2018 pre-Houston output or his career 3.54 ERA/3.56FIP then losing him is much more reasonable.If Blake Parker can replicate his 2018 ERA (Not a given but possible) we will have essentially replaced Ryan Pressly.If Romero, Mejia or another newcomer in the bullpen can manage a 3.50 ERA we will have essentially replaced Ryan Pressly.I like the direction our analytics is going but I'm not ready to say we would have the same results with Pressly that Houston had immediately with him. 1.1 of his 1.9 fWAR was with Houston in 23.1 innings, he managed 0.8 in 47.2 innings with us.Had he continued on his Twins pace he would have had a 1.2 fWAR and been ranked 39th among relievers.Still a great mark but Houston deserves a lot of credit here. I'm sure Houston's adjustments helped him achieve those absurd numbers in August & Sept, but we can fairly assume he was gonna have a monster second half no matter where he was. The dude was throwing unbelievably well when the Twins traded him. He had a 0.90 ERA, .523 opponents' OPS and 17% swinging strike rate in 10 July appearances for the Twins before they dealt him. He's one of the nastiest pitchers in baseball, plain and simple. That was evident before he was moved. It just seems so odd to me that they invested all that time and effort into developing him into such a weapon, then just as they were starting to fully reap the benefits, they trade him for another project. I saw Pressly my requisite two times against the Angels. He had two blown saves. Blame can be laid at the feet of the pitching coaches from what I witnessed. I don't remember the first appearance, but in the second appearance, he gave up a two-run blast. Out of 16 pitches, he threw 14 breaking balls. His last breaking ball was hammered. He was visibly upset and struck Trout out with three consecutive fastballs--completely overpowered him. It was head scratching. I thought Pressly credited the Twins for turning him around?The Astros simply doubled down on it to make him elite. I wonder if we'll end up being more content with the bullpen than many of us thought and it will be the rotation that will be our bane.Just a nagging concern I can't shake. Warning: off-topic post approaching...I just returned home from my gym where I got to watch MLB baseball during prime time--a first for me here in Japan. The gym area closed with two outs and two strikes on Chapman, so I am assuming the Mariners beat the A's 9-7, which made the fans in The Big Egg happy because they could see a win in Ichiro's unretirement party (of two games). Since he didn't get any hits, they showed him lining a foul ball to right field at least six times. Interestingly, two former Twins appeared: ロビー　グロスマン　&　フェルナワドー　ロドニ (Robbie Grossman and Fernando Rodney). Robbie Grossman pinch hit in the 7th and slapped a single to left on a 3-2 fastball and Fernando Rodney was three balls on every batter but only gave up a walk and a single. The Japanese announcers were fascinated with Rodney's classic pose, showing a replay of his pose for the TV audience (he did it before the game had started). It was fun to watch. The Twins will likely be on TV more this year because of Kikuchi and Ohtani, so let's, "Play ball!" So what your saying is that before a great 10 game stretch prior to his trade, his ERA was at 4.14 with the 2018 Twins. Houston unleashed a completely different beast just like they did with Verlander, Cole, Osuna, and Morton.The player that Houston just resigned is not the same player the Twins traded.He was good but not one of the most elite relief pitchers in the game. So it sounds like Pérez will start the season in the pen. Watching Romero implode today makes me think he’ll be optioned to Rochester. Seems like a good chance Reed is IL’d, doesn’t it? They mentioned on the broadcast the Twins may head north with 11 pitchers. That sounds encouraging, actually. Houston unleashed a completely different beast just like they did with Verlander, Cole, Osuna, and Morton. The player that Houston just resigned is not the same player the Twins traded. He was good but not one of the most elite relief pitchers in the game. He was, to that point, also ridiculously overworked. He made his 41st appearance on June 29 during team game number 78. He was on pace to appear in 85 games. Mike Marshall holds the team record with 90 appearances in 1979. “Everyday” Eddie had 83 in 1996 and JC Romero had 81 in 2002. No other Twin has ever been over 80. Houston drastically cut his workload. That is what made him an elite reliever IMO. Although none of us know what he is working on or his physical condition, Romero is pitching himself onto a flight to Rochester these last couple times out.His results today were ugly. I know this won't shock anyone because I've stated it multiple times. I simply no longer care for defined roles out of the bullpen. The only argument for defined roles is comfort and predictability under the assumption that players perform better with the knowledge of what role they have prior to arriving at the ball park. I don't buy this argument anymore. Do we have a lights out closer? I no longer worry about that. I want a lights out Bullpen. Would I like to have a big name high performance closer like Edwin Diaz on the roster... Yes I would... Absolutely!! But... I wouldn't necessarily use him exclusively as a closer in the conventional sense, just to have him sitting there waiting for a 9th inning lead of less than 3 runs to deploy. I would use him in the 6th, 4th, 8th... whenever the team needs a zero hung or a big strikeout with a runner on third and less than two outs during a close game. I would find creative ways to increase his innings pitched (not necessarily appearances) from 70 IP to 100 IP and beyond. You can't do this... if you conventionally restrict him to a specific role like closer. Quit giving 160 innings to a starter with a 5 plus ERA because your Dad always did it that way. Get bullpen serious!!! If you have a productive arm who is getting the job done... get him more innings to get the job done (starter or bullpen) and give less innings to the ones who are not getting the job done (starter or bullpen). It is so damn simple... "Throw your better pitchers more often" but yet impossible to do as long as everybody has these neat defined role little boxes to throw everybody into. If someone isn't getting the job done... try someone else until you are competitive from top to bottom. There are more than two options available to managers. Option A: Starters go 5 to 9 innings and rest for 5 to 6 days. Option B: Relievers throw an inning or less but can pitch back to back days until needing a day of rest. Yet... Managers have restricted themselves to only these two options. The entire middle ground between those two options should be theoretically available for consideration. Throw 3 Innings and rest 2 days could be option C and from there option D, E, F and so forth... leading to the ultimate goal of getting more innings out of your top performers. Throwing Edwin Diaz for 100 innings plus instead of reducing him on purpose to a limit of 70. Throwing Taylor Rogers for 120 Innings instead of reducing him on purpose to 70 IP. This team doesn’t have a lights out closer and has (at best) two “lights out” relievers - May and Rogers. Ryan Pressly says it was the Houston coaching and analytic dept. That's his opinion. At the time of the trade he was averaging an appearance every 2 games (pace for 81 games)with the Twins and that did decrease to an appearance every 2.3 games with Houston (pace of 70.4 games) But by this theory his 2017 would have been much better when he totaled 57 appearances over the entire healthy season (64 appearances if you include his demotion to AAA).Or in 2016 when he had a similar appearances per game to his Houston use of 2.25 (72Games), he was not elite in either of these seasons. Moya will start the year on the IL as well. At the time of the trade he was averaging an appearance every 2 games (pace for 81 games)with the Twins and that did decrease to an appearance every 2.3 games with Houston (pace of 70.4 games) But by this theory his 2017 would have been much better when he totaled 57 appearances over the entire healthy season (64 appearances if you include his demotion to AAA). Or in 2016 when he had a similar appearances per game to his Houston use of 2.25 (72Games), he was not elite in either of these seasons. You are not looking nearly deep enough into the numbers. On July 8, 2016, Pressly made appearance # 44 in game # 86. It was clear at the time that his stuff wasn’t as sharp. And there was no reason to overwork him. The 2016 team was never in the race. Apparently, the manager realized this during the AS break, cut his load and he was able to finish out the season with only 28 appearances in the team’s remaining 76 games. I speculated at the time (not sure if it was on this board - that may have been rube chat that far back) that the damage may have already been done and that Pressly would likely struggle the following year, especially if he was overworked early again. On May 7, 2017, Presly made appearance number 15 in game number 29. The results had been so poor to that point, the Twins had no choice but to reduce his workload. Big shock, his ERA dropped 4 points the rest of the way with a lower workload. Agree completely about Reed. Just doesn’t have it. And I know a lot love Alcala but he simply isn’t a better pitcher than Wells. At all. And why is Wells in the pen? He’s definitely starter material, maybe long relief I suppose. But SP is pretty jammed so.. but yeah, No to Reed. So your argument is that it is a mental thing when he pitches too often or he is physically breaking down?You would think that his velocity/Movement would reflect some sort of change on a month to month change if he was physically affected by his workload.His innings per month isn't really supporting a drastically lower workload.More rest days but longer outings.Would this disqualify him from any sort of defined closer role if you were running the team? In 2017 Pressly pitched 9 innings in april, 9 innings in May.You call this overworked. He pitched 11.2 in July, 16 in July, 11.2 in August.You call this a lower workload. I'm going out on a limb here and saying that he worked on something or had a wake up call with the June demotion to AAA. 2016 also show no signs of overworked in an innings per month standing.Certainly doesn't seem like less equals more.Had he thrown 2/3 of an inning more in June would he have lost that 4 point improvement? We are over thinking what Ryan Pressly himself has told us is the a result of Houston coaching staff.